bubbles… | Salt 'n Peppah! This post was part of a short story prompt blog that I wanted to attempt. All that was supplied was the photo. Hope you like it. Crystal glared through misty eyes as the bubbles danced downward from the top of her apartment building’s rooftop. The sun seemed cooler up here above the city and there was always a breeze that seemed to whisper tauntingly for Crystal to climb the forty-one flights of stairs from her tiny efficiency apartment on the ninth. The old art deco cement building itself rose softly into the city skyline struggling to claim its piece of a sunny day among the taller structures. Crystal blew harder this time and watched again as the bubbles in her world dropped delicately to the noise below, roundly reflecting bits of windows into the tiny lost lives of others in this large city. Crystal looked below at the green park which was filled with playing children that looked like ants as they climbed monkey bars and ran to swings. She could not hear them, but she wanted to BE them. Would they look at her oddly if she took her bottle of soap to the plush grass below? Would it matter to the children that a grown woman was running through the park in tears waving her orange wand of soap in the sultry summer air… becoming breathless as the sobs shook on? Would they still stare and laugh at her? Crystal felt alone and isolated up here, exacerbated by her distance from the tiny giggling ants. She felt as void of color as the glamorous glass of her namesake. She was depressed and found herself slipping deeper into her chasm of despair as others began to stare more frequently at her while avoiding her dull blued eyes. One more time, she squeezed her eyes tightly as though shutting out the indifference in front of her or perhaps it was to keep inside the few remaining parts of herself she understood. The tears continued to slip into her slightly opened mouth as if she could taste her pain away. Her heart was crushing into her soul as she looked once again at the bottle of bubbles beside her. She was jealous of their freedom and their dances of frivolity. Crystal picked up the bottle and fished frantically for the pretty orange wand inside. It has slipped her grasp twice with its soapy slime as the third time she lifted the wand and blew as she spit spent tears within the bubble. She watched over the edge of her building as she stretched her long graceful painted neck to follow its path. Not noticing as a single tear dropped delicately to the pavement below. Crystal wanted to follow the bubble as she stood up on the edge of the stucco wall to get a better view. At first she felt like the air as she flew… as light as a clear bubble while the windows whisked passed her eyes and people continued to stare her way. She giggled slightly at the irony, then barely whimpered a sigh as she pummeled like a thrown rag doll onto the roof of a waiting taxi cab. Crystal’s silence was shattered by a wailing horn and a screaming child, as her blood mixed with the broken bottle of soap dripping onto the cold street below… and no one watched as a lone bubble drifted, then lifted higher with purpose to the sunny sky above. It’s so very sad that such a painful illness is an illness many refuse to see. An excellent write, Ed. Thank you for reading Kay and also for your commenting. 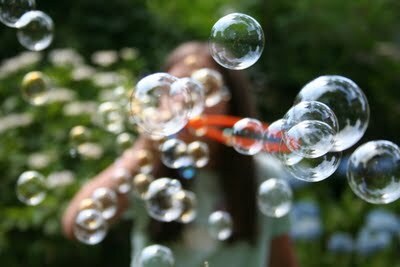 I thought it might be interesting to take a photo of playful bubbles and twist it on end with this short story about a woman who was an outcast. I enjoyed the exercise immensely! The ending caught me out, which means it must be well written. I like the image of the single bubble rising up. Well done! And thanks for visiting my blog earlier. An excellent, though tragic write. I had a feeling about a thrid the way through it that it would not end well. Nicely done! My, you spin a fine tale. I loved this story and the tragedy of it. It was nice to set aside the usual happy, peaceful delicacy associated with bubbles. Held them in a far different light. It worked for me! Thank you, thank you, THANK YOU Lena! You got it! I’m not necessarily a fan of tragedy, but when I saw this pretty little photo of a girl blowing bubbles, I wondered HOW could I take the usual thought of peaceful, playful joy and turn it into something totally different while still incorporating the act of the blowing bubbles. LOL…it sounds like I thought alot about it, but I didn’t really. I DID, however, really enjoy working a prompt (which I’ve never done before). This is such a great story and your ending left a big impression on this story how a single bubble could lift up from the ground and float towards the sun and clouds. I could just see the bubble being formed and moving on upwards. Thanks for checking it out Sarah! Looking forward to checking out your blog. very careful piece of writing, thanks for the unique take, and the intelligence in it. Thank you very much. I truly appreciate your comments. Thank you for reading Jeanie! I wanted to take a photo that always elicits happy thoughts and turn it around. Guess I succeeded! Thank you for reading! I appreciate the comments.